Andrew Fagan finished his eighth grade year by winning a GoPro Camera for his documentary, “Farmers Struggle During the Dust Bowl.” He received the camera from teacher Dawn Thorp at USD 347 Junior High Awards assembly in the school auditorium on May 20. 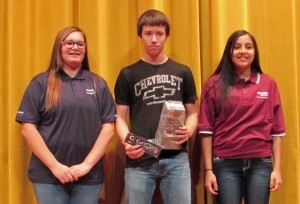 Toshea Dupree and Rachel Alvarez received second and third place awards of Fujinon T-shirts. The GoPro Camera and T-shirts were donated by Jay Kriss, owner of Inspirit Creative recently relocated to Durango, Colorado.